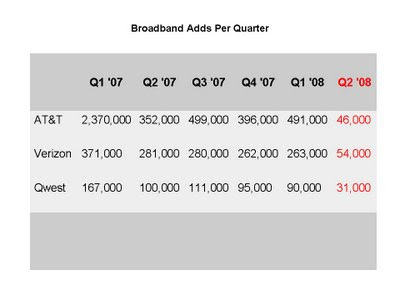 Gary Kim has this chart to demonstrate the sharp decline in new broadband customers. And if that isn't enough Ike Elliott has more detailed info on his blog today. It's a good thing for the ILEC's that their churn is less than 2% and closer to 1%. If you are in the broadband access race, you need to start looking for another horse to ride.